TURIN, ITALY - MARCH 13, 2017: The painting of Last Supper in Duomo after Leonardo da Vinci by Vercellese Luigi Cagna (1836). 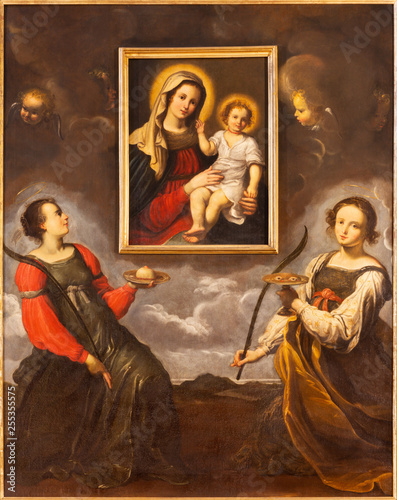 MODENA, ITALY - APRIL 14, 2018: The baroque ceiling fresco with St. Barbara in church Chiesa di San Barnaba by Sigismondo Caula and Antonio Mannini from begin of 18. cent. 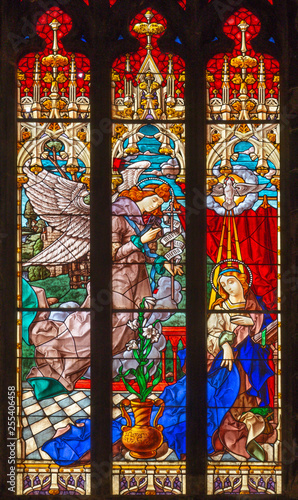 PALMA DE MALLORCA, SPAIN - JANUARY 29, 2019: The Annunciation in the stainedglass of the church Esglesia de la Inmaculada Concepcion. 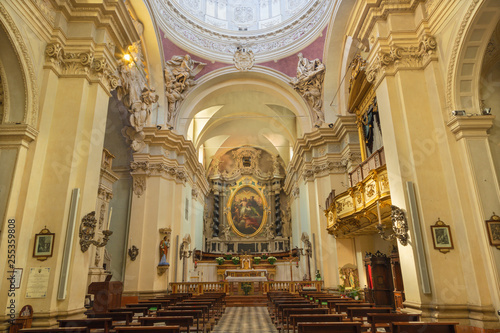 PRAGUE, CZECH REPUBLIC - OCTOBER 18, 2018: The baroque church Kostel Svaté Alexandrijské with the fresco in cupola by Václav Vavřinec Reiner (1689 - 1743). 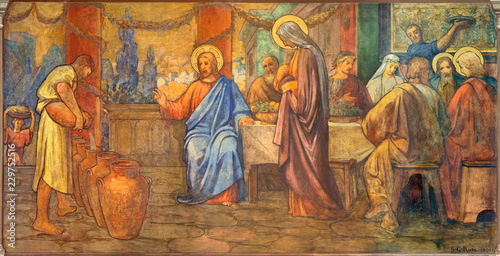 PRAGUE, CZECH REPUBLIC - OCTOBER 13, 2018: The fresco of Last Supper in church kostel Svatého Václava by S. G. Rudl (1900). 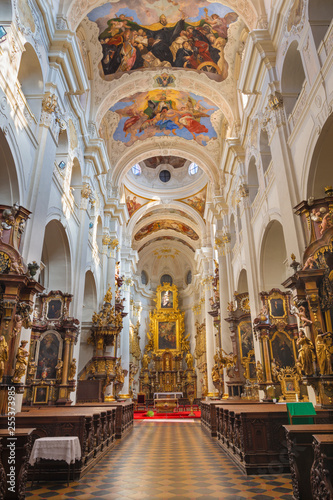 PRAGUE, CZECH REPUBLIC - OCTOBER 12, 2018: The baroque church kostel Svatého Tomáše with the frescoes by Václav Vavřinc Reiner (1689 - 1743). 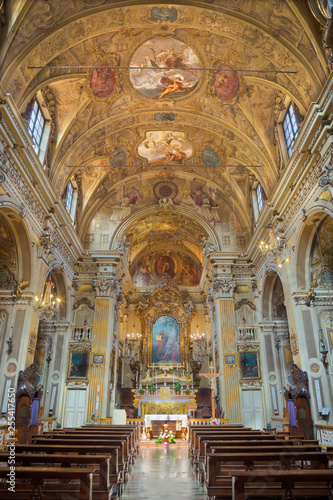 REGGIO EMILIA, ITALY - APRIL 13, 2018: The nave of chruch Chiesa di Santi Giacomo e Filippo apostoli. 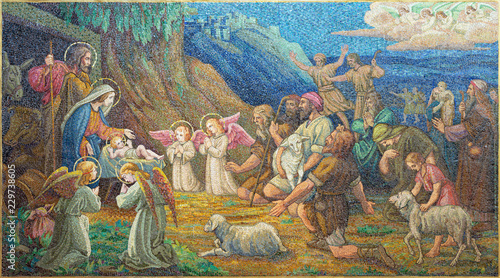 REGGIO EMILIA, ITALY - APRIL 12, 2018: The painting of sheepherds in church Chiesa dei Cappuchini by Padre Angelico da Villarotta (1900 - 1987). 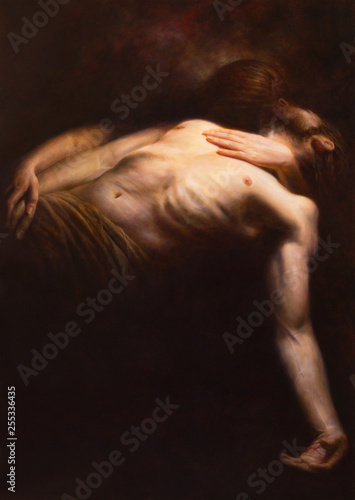 LONDON, GREAT BRITAIN - SEPTEMBER 17, 2017: The painting of Pieta in church St. James Spanish Place. 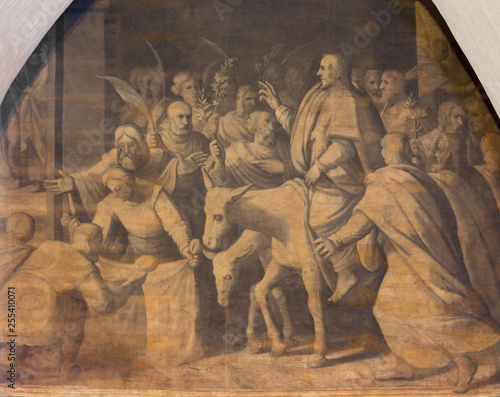 REGGIO EMILIA, ITALY - APRIL 12, 2018: The painting of Biblical scene in church Basilica di San Prospero from 16 cent. 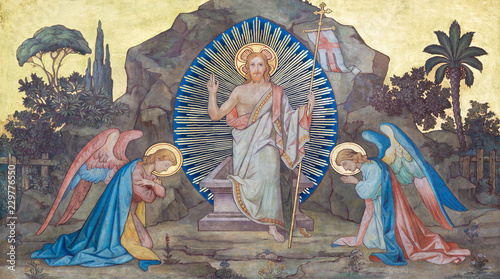 PRAGUE, CZECH REPUBLIC - OCTOBER 17, 2018: The fresco of Resurrection in church kostel Svateho Cyrila Metodeje probably by František Sequens (sc. half of 19. cent.). 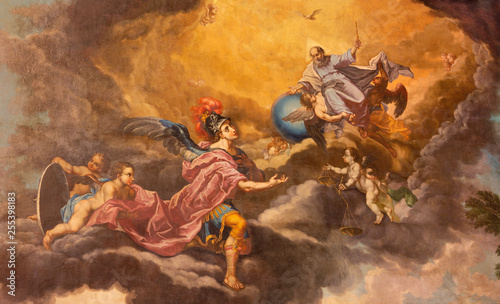 PALMA DE MALLORCA, SPAIN - JANUARY 27, 2019: The painting of God the Creator and St. Michael archangel in presbytery of church San Miguel by Juan Muntaner Cladera (end of 18. cent.). 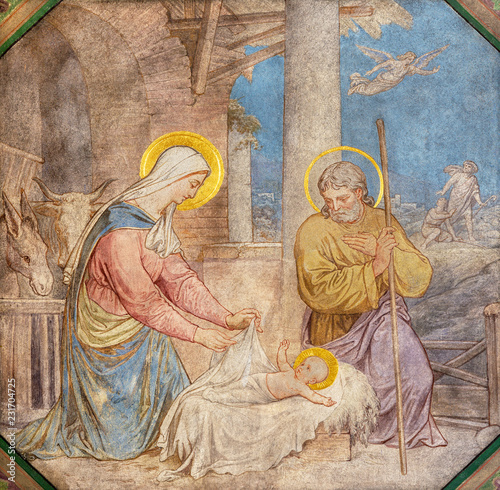 PRAGUE, CZECH REPUBLIC - OCTOBER 17, 2018: The fresco of Adoration of Magi and Nativity in the church kostel Svateho Cyrila Metodeje probably by Gustav Miksch and Antonin Krisan (19. cent.). 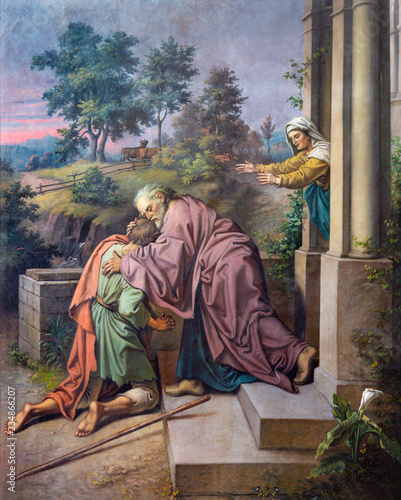 PRAGUE, CZECH REPUBLIC - OCTOBER 18, 2018: The fresco of scene comeback of Prodigal son in the church of St. Ignace by Jan Umlauf (1875). LONDON, GREAT BRITAIN - SEPTEMBER 16, 2017: The stained glass of Last Supper the Pantokrator in church St Etheldreda by Joseph Edward Nuttgens (1952). 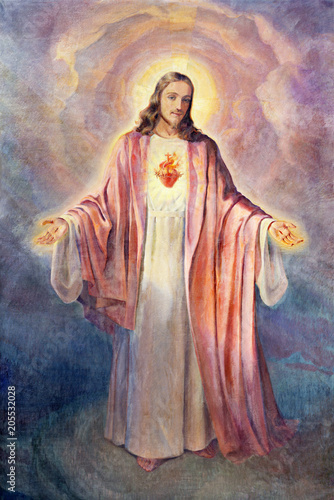 PALMA DE MALLORCA, SPAIN - JANUARY 29, 2019: The painting of Heart of Jesus in the church Iglesia de Santa Teresa de Jesus. 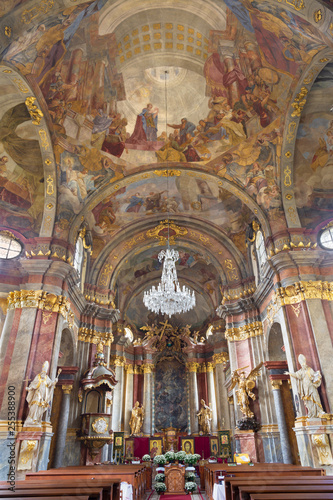 PRAGUE, CZECH REPUBLIC - OCTOBER 17, 2018: The fresco of Adoration of Magi the in church kostel Svatého Cyrila Metodeje by Petr Maixner (1868). 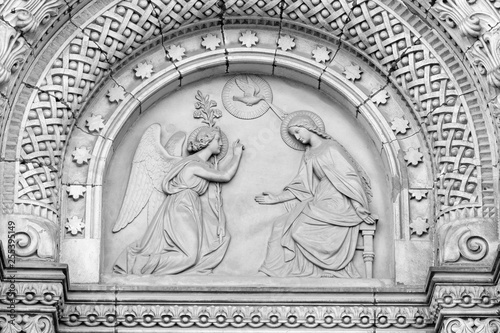 PRAGUE, CZECH REPUBLIC - OCTOBER 12, 2018: The symbolic mosac of Lamb of God in church Bazilika svatého Petra a Pavla na Vyšehrade. 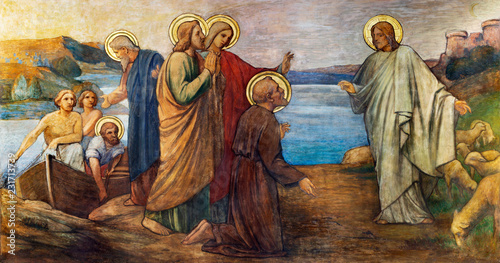 PRAGUE, CZECH REPUBLIC - OCTOBER 13, 2018: The fresco of Miracle fishing Jesus in church kostel Svatého Václava by S. G. Rudl (1900). 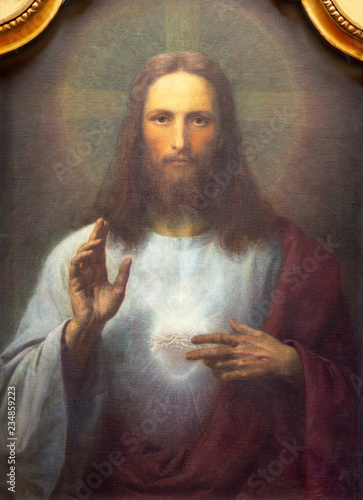 REGGIO EMILIA, ITALY - APRIL 14, 2018: The painting of Heart of Jesus Christ in church Chiesa di San Bartolomeo from 20. cent. 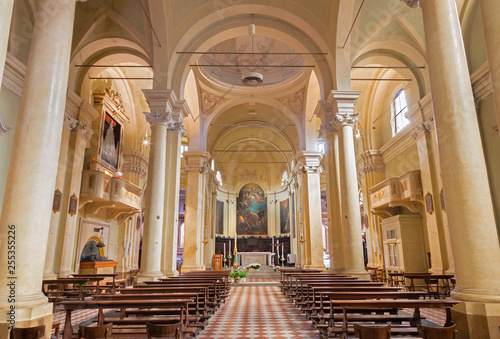 PARMA, ITALY - APRIL 16, 2018: The ceiling freso of The Holy Trinity in church Chiesa di Santa Croce by Giovanni Maria Conti della Camera (1614 - 1670). 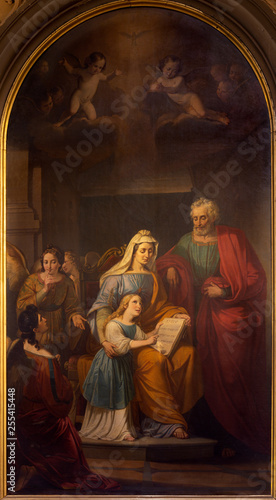 PRAGUE, CZECH REPUBLIC - OCTOBER 17, 2018: The fresco of Nativity the in church kostel Svatého Cyrila Metodeje by Petr Maixner (1872). 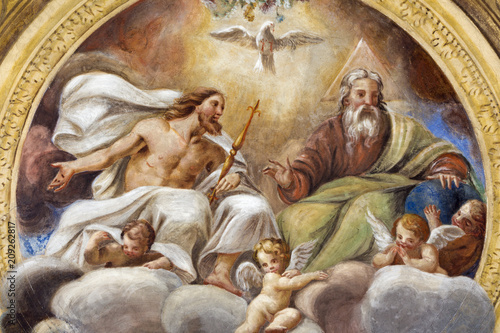 REGGIO EMILIA, ITALY - APRIL 13, 2018: The fresco of angels with the symbolic keys of St. Peter in church Chiesa di San Pietro by Anselmo Govi (1939). 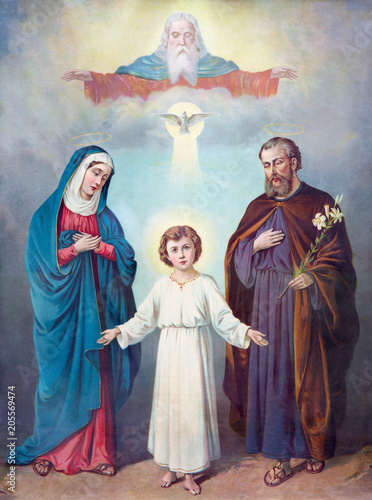 SEBECHLEBY, SLOVAKIA - FEBRUARY 27, 2016: Typical catholic image of Holy Family and Trinity (in my own home) from the end of 19. cent. printed in Germany originally by unknown painter. 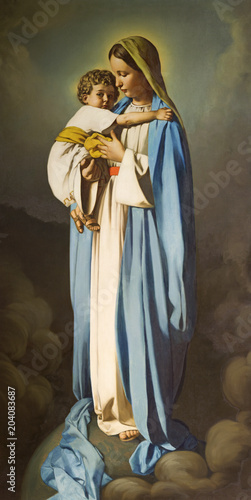 REGGIO EMILIA, ITALY - APRIL 12, 2018: The painting of Madonna with the Child in church Chiesa dei Cappuchini by Padre Angelico da Villarotta (1939). 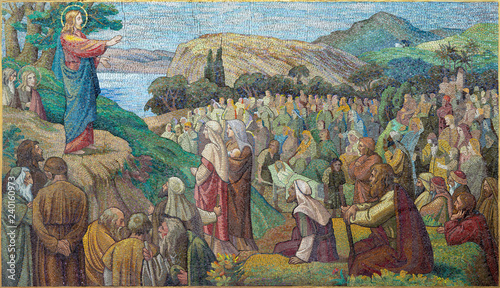 PRAGUE, CZECH REPUBLIC - OCTOBER 13, 2018: The fresco of The wedding at Cana in church kostel Svatého Václava by S. G. Rudl (1900). 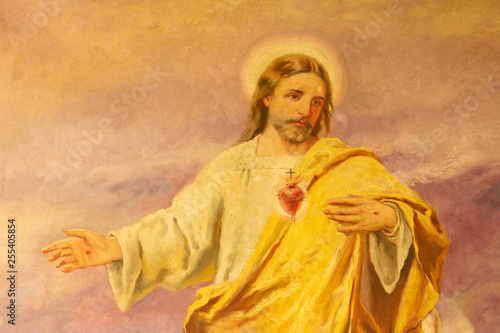 PRAGUE, CZECH REPUBLIC - OCTOBER 12, 2018: The painting of Heart of Jesus in church kostel Svatého Tomáše by unknown artist of 19. cent. 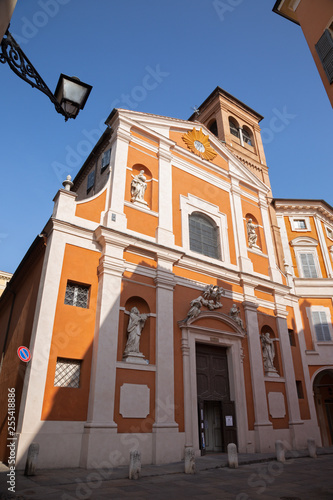 MODENA, ITALY - APRIL 14, 2018: The facade of baroque church Chiesa di San Barnaba. 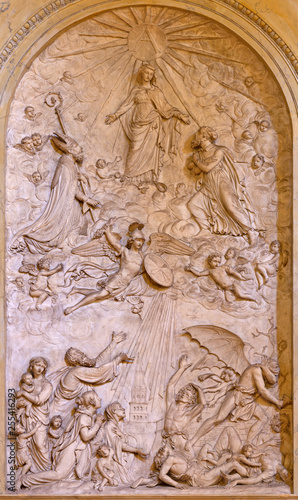 REGGIO EMILIA, ITALY - APRIL 14, 2018: The relief of Virgin Mary among the saints in church chiesa di San Francesco by unknown artist. MODENA, ITALY - APRIL 14, 2018: The romanesque relief of Kain and Abel from paradise on the facade of Duomo di Modena. 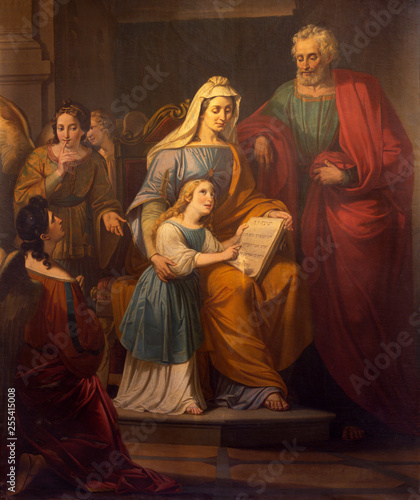 REGGIO EMILIA, ITALY - APRIL 14, 2018: The painting of St. Joachim, little Virgin Mary and st. Ann in church chiesa di San Francesco by unknown artist. 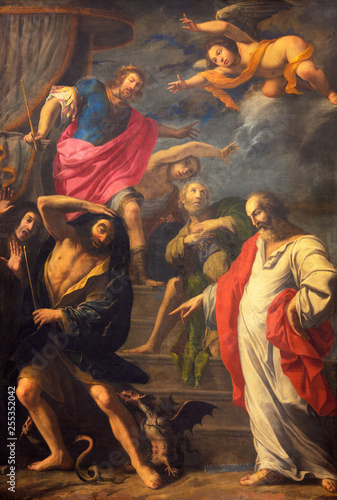 ZARAGOZA, SPAIN - MARCH 3, 2018: The painting Entry of Christ in Jerusalem in the church Iglesia de San Pablo by Antonio Glaceran and Jeronimo de Mora (1596). 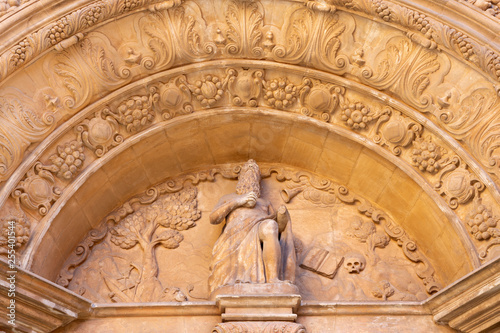 PALMA DE MALLORCA, SPAIN - JANUARY 27, 2019: The detail from portal of church Iglesia San Jeronimo from 14. cent. 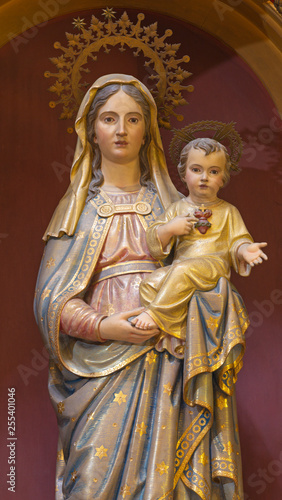 PALMA DE MALLORCA, SPAIN - JANUARY 28, 2019: The carved polychrome Madonna in church Iglesia Nuestra Senora del Socorro. 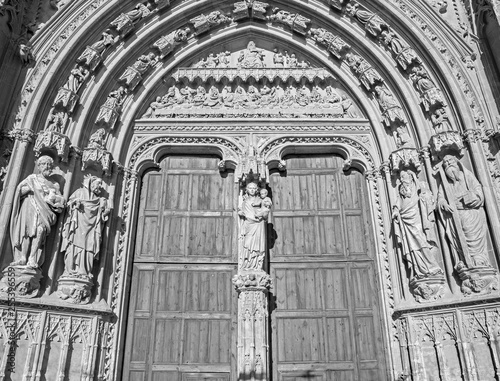 PALMA DE MALLORCA, SPAIN - JANUARY 30, 2019: The south portal of cathedral La Seu with the stone relief of Last Supper by masters Pere Morey, and Guillem Sagrera Sagrera (1389 - 1394). 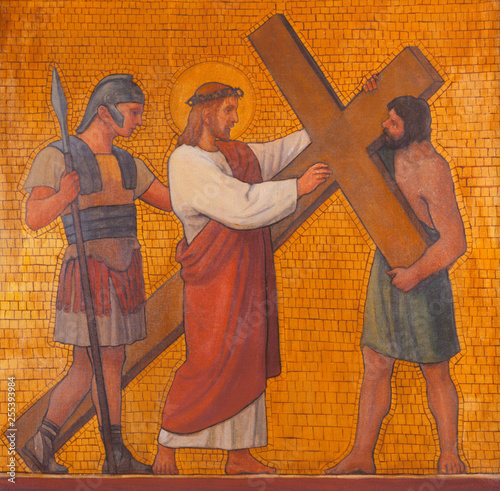 PRAGUE, CZECH REPUBLIC - OCTOBER 17, 2018: The painting Jesus accepts his cross in the church kostel Svatého Cyrila Metodeje by S. G. Rudl (1935). 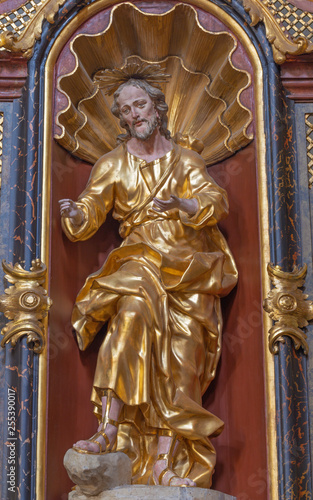 PRAGUE, CZECH REPUBLIC - OCTOBER 18, 2018: The carved polychrme statue of St. Joseph in church Kostel Svaté Alexandrijské by František Ignác Weiss (1737 - 1741). 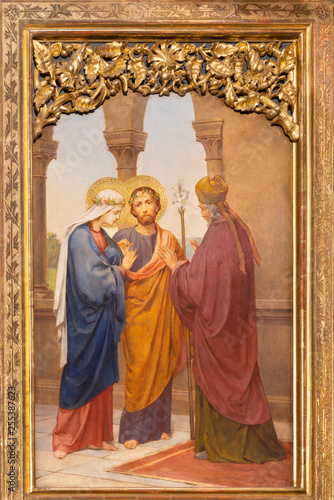 PRAGUE, CZECH REPUBLIC - OCTOBER 12, 2018: The painting of Wedding of Virgin Mary and St. Joseph in church Bazilika svatého Petra a Pavla na Vyšehrade by S. G. Rudl (1895). 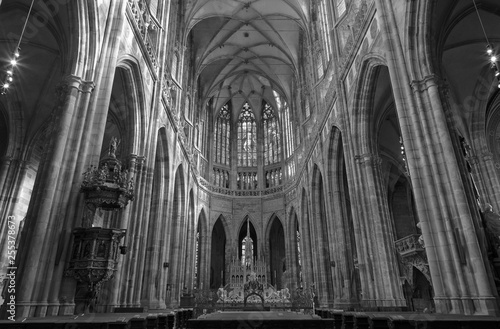 PRAGUE, CZECH REPUBLIC - OCTOBER 14, 2018: The sanctuary of gothic St. Vitus cathedral. 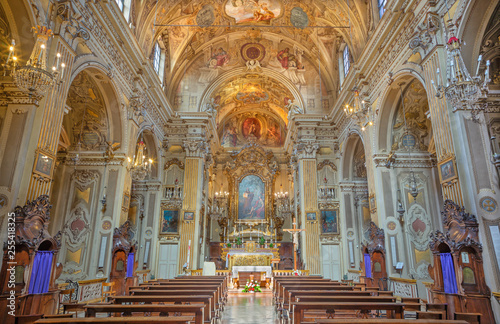 PARMA, ITALY - APRIL 17, 2018: The baroque church Chiesa di Santa Teresa. 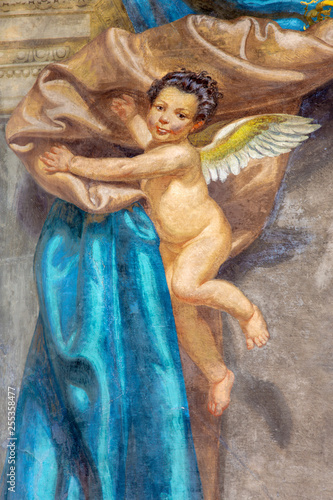 PARMA, ITALY - APRIL 17, 2018: The detail of baroque angels with the drapery fresco in church Chiesa di San Bartolomeo from 17. cent.